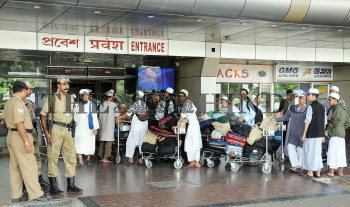 Caption : Kolkata: The domestic passengers waiting at the Netaji Subhash Chandra Bose International Airport in Kolkata on Tuesday. Workers affiliated to central trade unions on Tuesday went on a day-long industrial strike across the country to protest against price rise, alleged violation of labour laws and disinvestment in PSUs disrupting normal life in Left-ruled West Bengal. Photo: Arunangsu Roy Chowdhury September 07, 2010.